9/11, 7/7 & the War on Freedom :: View topic - Austerity: fascist 1930's Govt. destroying the poor again? Austerity: fascist 1930's Govt. destroying the poor again? Posted: Thu Dec 04, 2014 2:14 pm Post subject: Austerity: fascist 1930's Govt. destroying the poor again? 'George Osborne’s Autumn Statement today has deftly underscored a point we have been making at Scriptonite Daily since 2010 – Austerity is not a temporary measure to balance the books, but an ideological commitment to remove the NHS and the rest of the post World War II welfare state. According to the Office for Budget Responsibility, Osborne’s latest round of planned cuts will reduce public spending to the levels of the 1930’s. On arrival in government, the Conservative section of the Coalition government were keen to present austerity as temporary, necessary and purely practical. Back in 2010, Cameron claimed that he “didn’t come into politics to make cuts”, and that austerity was simply temporary spending restraint based on a necessary effort to cut the deficit, not “some ideological zeal”. In 2014, ‘Austerity’ is delivering the half century long ambition of the Conservative party: to revoke the post-war social contract of the United Kingdom. The modern welfare state: decent pensions, affordable and decent social housing, a publicly funded and managed healthcare system, a reliable and low cost transport system, the guarantee of a decent education regardless of circumstances of birth. This was the social contract the UK public signed up to in the post war period. Why? Because these generations had lived through the horrific consequences of unrestrained capitalism; enormous inequality, widespread poverty and destitution, starving and malnourished children, an entrenched class system, the benefits of the hard work of the many enjoyed by a privileged and undeserving few. There are now just 101 days to go before the General Election. That means just 101 days left of this ConDem government. And today we reveal 101 broken promises, U-turns and failures which have haunted David Cameron and Nick Clegg since 2010. The Conservatives and Lib Dems came to power pledging to eliminate the deficit, clean up political sleaze, protect the NHS and build a fairer society for all. But, since their matey press conference in the sunshine of Downing Street’s Rose Garden, they have presided over five years of economic disasters. There’s an NHS crisis and the most vulnerable have been hit hardest by savage cuts. But those on the highest tax band were given a break with the abolition of the 50% rate. From the Bedroom Tax to immigration and politicians behind bars, our list reveals missed targets, broken pledges, sleaze and billions of pounds wasted. It shows cruel policies, dodgy practices and countless foolish blunders. We suggest you keep all 101 failures in mind when deciding how to vote on May 7. 1. Deficit still at a staggering £80billion despite Tory election pledge to balance the books by 2015. 2. National debt still rising after five years of Coalition and now standing at almost £1.4trillion. 3. Osborne has overspent his plans by £200billion and borrowed more than Labour did in 13 years of government. 4. Britain’s productivity rate is still miserably low and is now 21% lower than average output of other G7 countries. 5. Treasury is still missing out on a shocking £34billion a year through tax avoidance despite a promised clampdown. 6. Major firms say constant Tory threats to leave the EU are damaging long-term investment in Britain. 10. Iain Duncan Smith’s failed ‘Work Programme’ leaves more than 650,000 people OUT of work for more than a year. 13. Family finances hammered by a surprise VAT hike to 20% - despite Tory claims that they had “no plans” for a tax rise. 14. Energy bills have soared by more than a third since 2010 - far above wage rises. 15. Average rents up by 13% since the last election - far above wage rises. 16. Water bills up 12.5% since the last election - far above wage rises. 17. Number of workers trapped on exploitative zero-hours contracts has soared since 2010, and is now at 1.4million. They earn £300 a week less than permanent colleagues, according to the TUC. 19. Rail fares up nearly 25% since the last election - far above wage rises. 20. The richest 1% of Britons now own the same amount of wealth as 54% of the population. 21. £3billion wasted on a top-down reorganisation of the NHS that nobody voted for. 22. More privatisation of our cherished health service following hated Health and Social Care Act. The BMA says that a third of nearly 3,500 NHS contracts went to private firms. 23. Waiting time for cancer treatment at a six-year high. 24. A&E departments in meltdown with key targets missed week after week. Earlier this month, more than one in five patients were not seen within the four hour target - officially the worst performance since records began. 25. Proportion of people who get to see a GP within 48 hours slumps from 80% to 40%. 33. University students hammered with £9,000-a-year tuition fees despite Lib Dem promise not to hike fees. 34. The Tories’ pet ‘free school’ projects divert cash away from needier areas with school place shortages - a third of funding for school places, or £1.7bn, in 2014/15. According to the NUT, free schools are three times more likely to employ unqualified teachers and just 67% were rated good or outstanding by Ofsted, compared to 80% of state schools. 41. The Tories’ cruel and vindictive Bedroom Tax has hammered the most vulnerable in society. The Tax is costing 500,000 households an average £700 extra a year. One in three victims are disabled and 60,000 are carers. Sixty per cent were in rent arrears as a result. 45. Councils forced to slash funding for elderly care after losing a quarter of their own budgets since 2010. Cuts of £1.1bn mean the number of elderly people receiving care fell by nearly 30% from 1,230,625 under Labour to 849,280 now. 46. Brutal benefit sanctions regime introduced which punishes the poorest in society by withdrawing their money for weeks at a time. Campaigners say sanctions have also been used to massage jobless figures. 50. Almost one million people now turning to food banks due to brutal cuts in support. The number of working people claiming housing benefit up by 60% since 2010. 51. Nearly 500 public libraries closed or abandoned for volunteers to keep afloat since the last election. 52. More than 2,000 youth workers axed and at least 350 youth centres closed across the country since 2010. 53. Vital bus services relied upon by the young, poor and elderly cut by 50% in some areas due to massive town hall funding cuts. 55. House-building slumps to its lowest peacetime level since the 1920s. 56. Pub closures soar with Britain now losing 29 community pubs every week. 59. David Cameron’s dream of creating a ‘Big Society’ of volunteers falls flat and is quietly dropped. 62. The bungling Home Office loses tracks of 174,000 illegal immigrants - and admit many of them will never be found. 63. Chaos at the Passport Office after massive staff cuts left thousands of families unable to go on holiday in 2014. 69. Almost £1billion wasted on the failed ‘eBorders’ IT system which was supposed to modernise border control. 70. Unknown numbers of people entered the UK unchallenged during a secret 2011 pilot scheme to relax mandatory checks. 71. British Army slashed to just 80,000 troops by 2020 - its lowest level for 200 years. 72. Soldiers sacked, army barracks shut down and sold off and 300-year-old brigades disbanded in the biggest Army cuts in decades. 73. Vital decision on renewing Trident nuclear weapons system kicked into the long grass after a fierce Coalition row. 74. More than £100million wasted on a costly U-turn over the type of fighter planes purchased for Britain’s new aircraft carrier. 75. Police numbers axed by 15,000 staff in just five years - the biggest police cuts of any country in Europe. 77. London’s Deputy Mayor Stephen Greenhalgh, Boris’s right-hand man in charge of policing, warns Scotland Yard still does not have enough cash to keep Britain safe from terror attacks in 2015. 78. Theresa May forced into an embarrassing U-turn over terror control orders after admitting key measures which were dropped by the Coalition are actually essential to keep Britain safe. 79. British prisons in crisis with overcrowding, prison escapes, staff assaults and inmate suicides all soaring under Justice Secretary Chris Grayling. 80. Public safety put at risk as right-winger Mr Grayling puts the vital probation service into the hands of private companies. 81. The Conservative Party is still funded by a bunch of City fatcats and tycoons - who benefited from a millionaires’ tax cut from George Osborne. 82. Sleazy Lib Dem David Laws was forced to quit as Treasury Secretary just days after being appointed over his expenses claims - but was still handed a new Government job two years later. 83. Fellow Lib Dem Chris Huhne was also forced to quit the Cabinet and later jailed after lying to cops about a speeding rap. 85. David Cameron gave his firm backing to expenses shame Culture Secretary Maria Miller - shortly before she was forced to resign in disgrace. 86. And he made disgraced newspaper editor Andy Coulson the chief spin doctor in Number 10 - shortly before he too was forced to resign. 89. Tory Defence Secretary Liam Fox was forced to resign in 2011 over his close links with lobbyist Adam Werrity. 92. The Tories appointed a right-wing Environment Secretary, Owen Paterson, who didn’t believe in climate change. 93. The botched badger cull saw thousands of animals butchered at a cost of £3,350 per head - without having the desired effect. 94. Bungling Tories were forced to drop plans to sell off Britain’s forests to private firms after a huge public outcry. 95. After claiming to back renewable energy, David Cameron announced he wants a moratorium on all future onshore wind farms. 96. Government support for people installing solar panels was halved in 2011, leading to a 90% cut in demand. 97. The Tories’ flagship ‘Green Deal’ scheme of energy efficient home improvements was a disastrous flop, with just 132 people signing up in the first eight months. 98. George Osborne attacked “costly” green energy and backed risky fracking for shale gas instead. 99. Air pollution levels have got worse in British towns and cities despite Government pledges to reduce toxic fumes. 100. Massive cuts to flood defence budgets in 2010 left Britain badly exposed to repeated flooding in the years that followed. 101. The PM is trying to chicken out of TV election debates - despite admitting that trying to avoid them would be “feeble”. So its not all bad then! So when the world is warming because of man's activities the explanation for the cold is that it is being created by man's activities. So what is the problem? If we can do both then we can make the climate whatever we want. The relentless bilge to keep this scam going is incredible. Literally. Seems they're way ahead of schedule. Parts of the Tories’ trade union crackdown resemble measures enforced under General Franco’s Spanish dictatorship, one of the party’s senior MPs has said. David Davis, a former shadow Home Secretary and noted civil libertarian, criticised the idea that individual people on picket lines should be forced to register with the police. “I agree with most of the Trade Union Bill - I think it's very sensible,” he told the Murnaghan programme on Sky News. General Franco was the dictator of Spain between 1936 and 1975, ruling a hard-right ultra-nationalist one-party state. The criticism of the proposed law comes after a YouGov poll found that 65 per cent of the public are against provisions in it to bring temporary agency staff to break public sector strikes. The Trade Union Bill includes sweeping provisions including proposals to ban strikers from using social media and to introduce higher voting thresholds for industrial action. Business Secretary Sajid Javid said the bill would balance the rights of people wanting to take action “with those of working people and business”. Health bosses believe the measures will help the NHS get the deficit down to £250m this year after an overspend of £2.45bn was posted in 2015-16, the highest ever recorded and triple what it was the previous year. That figure also covered the budgets for mental health units and ambulances, but it was the hospital sector that ran into the most difficulties with nearly nine in 10 ending the year in the red. NHS England chief executive Simon Stevens said this was a make-or-break period. "Precisely because the pressures across the NHS are real and growing, we need to use this year both to stabilise finances and kickstart the wider changes everyone can see are needed." But Nigel Edwards, of the Nuffield Trust think tank, predicted the measures being taken on their own would not be enough. "My big worry is what happens next. I fear that in order for hospitals to virtually eradicate their deficits the next steps could be a series of brutal service reductions and bed closures - which will shock an unprepared public." Meanwhile, it has emerged the financial problems in hospitals almost meant the Department of Health failed to balance its budget overall, which could have meant sanctions from the Treasury. 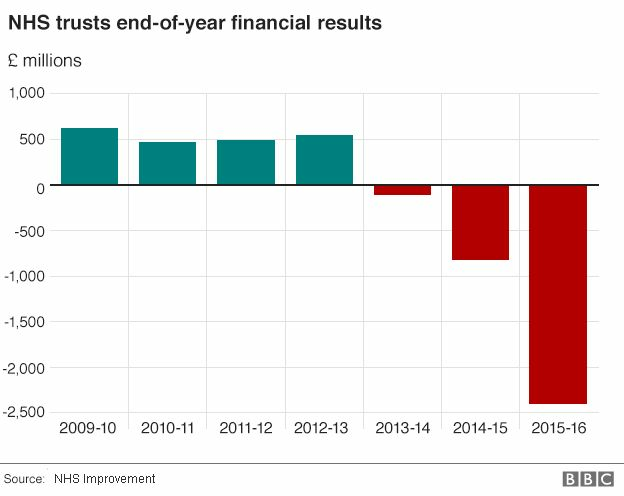 The department managed to cover the overspend by trusts by drawing on surpluses elsewhere in the health service, which meant it finished £210m in surplus on a budget of nearly £115bn. But this came only after it raided the capital budget, which is set aside for buildings and maintenance, by £950m, and identified £417m of extra income from national insurance receipts which it had failed to declare initially - something officials blamed on an "administrative error". Auditors said the steps taken this year to balance the books were not sustainable and should be considered a one-off. Real terms funding for health and social care fell under the Conservative-led Coalition Government in 2010, and the researchers conclude this “may have produced” the substantial increase in deaths. The paper identified that mortality rates in the UK had declined steadily from 2001 to 2010, but this reversed sharply with the death rate growing again after austerity came in. From this reversal the authors identified that 45,368 extra deaths occurred between 2010 and 2014, than would have been expected, although it stops short of calling them "avoidable". Based on those trends it predicted the next five years - from 2015 to 2020 - would account for 152,141 deaths - 100 a day - findings which one of the authors likened to “economic murder”. The Government began relaxing austerity measures this year announcing the end of its cap on public sector pay rises and announcing an extra £1.3bn for social care in the Spring Budget. Over three years the additional funding for social care is expected to reach £2bn, which Labour leader Jeremy Corbyn said was “patching up a small part of the damage” wrought by £4.6bn cuts. The study, published in BMJ Open today, estimated that to return death rates to their pre-2010 levels spending would need to increase by £25.3bn. The Department of Health said “firm conclusions” cannot be drawn from this work, and independent academics warned the funding figures were “speculative”. However local councils who have been struggling to fund care with slashed budgets urged the Government to consider the research seriously. Shadow Health Secretary Jonathan Ashworth said the Government must match Labour's spending pledges in the Autumn Budget. Per capita public health spending between 2001 and 2010 increased by 3.8 per cent a year, but in the first four years of the Coalition, increases were just 0.41 per cent, researchers from University College London found. In social care the annual budget increase collapsed from 2.20 per cent annually, to a decrease of 1.57 per cent. The researchers found this coincided with death rates which had decreased by around 0.77 per cent a year to 2010, beginning to increase again by 0.87 per cent a year. And the majority of those were people reliant on social care, the paper says: “This is most likely because social care experienced greater relative spending constraints than healthcare." The papers’ senior author and a researcher at UCL, Dr Ben Maruthappu, said that while the paper “can’t prove cause and effect” it shows an association. And he added this trend is seen elsewhere. “When you look at Portugal and other countries that have gone through austerity measures, they have found that health care provision gets worse and health care outcomes get worse,” he told The Independent. The Department of Health stressed that no such conclusion could be drawn. A spokesperson said: “As the researchers themselves note, this study cannot be used to draw any firm conclusions about the cause of excess deaths. And independent academics added that it is hard to prove cause and effect with this kind of study even if the underlying assumptions may be correct. Professor Martin Roland Emeritus Professor of Health Services Research, University of Cambridge said: “This study suggests that a change happened to cause deaths to stop declining around 2014. This is likely to be a correct finding. However, the link to health and social care spending is speculative as observational studies of this type can never prove cause and effect." Mr Ashworth, responding to the study, said: “This shocking mortality gap is a damning indictment of the dire impact which sustained Tory cuts to our NHS and social care services have had on health outcomes across the nation.